The all-new-for-2010 Mitsubishi Lancer Ralliart Sportback joins the already award-winning Lancer fold by bringing more versatility and performance to the lineup. 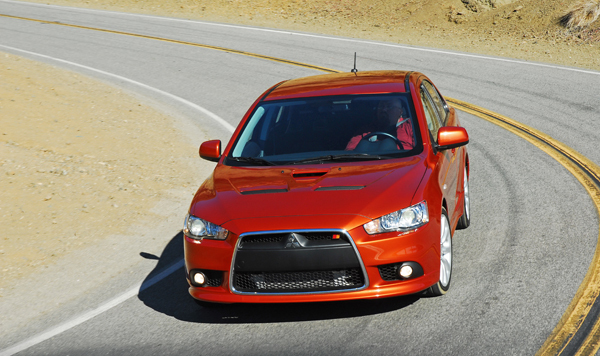 The Lancer Ralliart Sportback adapts the powertrain and all-wheel drive technology from the Lancer Evolution series. The result is a unique model with enhanced utility that is optimized for exhilarating yet balanced overall road performance. The Sportback gets the same version of the Lancer Ralliart 4B11 turbocharged & intercooled 2.0 liter DOHC MIVEC, all-aluminum, 4-cylinder engine that is derived from the Lancer Evolution, and is teamed with the quick shifting, twin-clutch-Sportronic shift transmission (TC-SST) from the Lancer Evolution MR model. 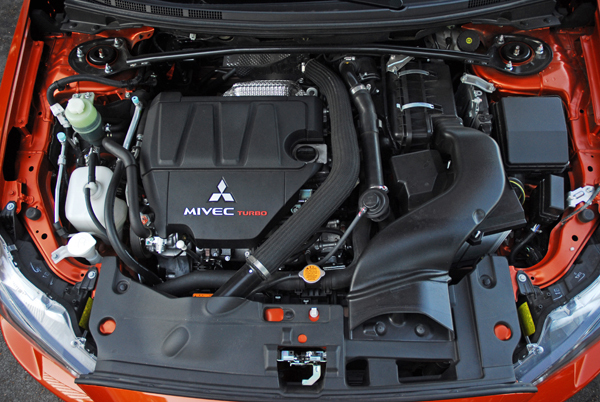 Starting with a Lancer Evolution long block assembly, the single scroll turbocharger & intercooler and variable-valve timing are modified for impressive street-oriented performance. The engine produces 237hp at 6,000rpm and 90% of the 253lb.ft. of peak torque available at just 3,000rpm. You can quickly manually shift using the console shifter or the Sportronic steering column-mounted magnesium alloy paddle shifters, or you can select fully automatic operation. 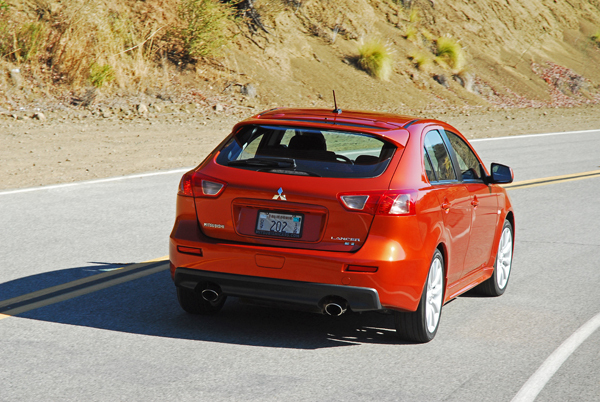 Either way the Ralliart Sportback is fun, easy and exciting to operate. The car rockets out to 60mph from a standstill in just 5.4sec. 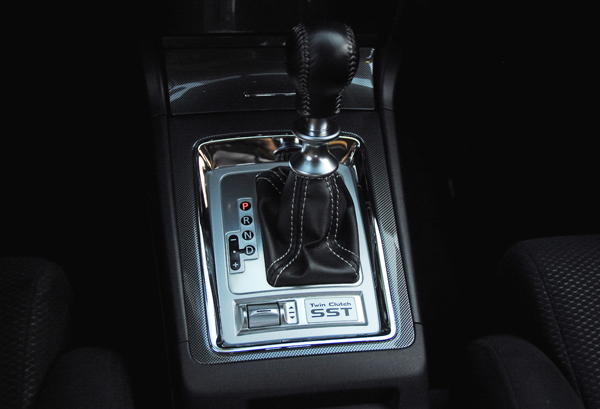 The car’s TC/SST unit features Normal and Sport shifting modes. Just push or pull-back the silver toggle switch next to the short, chromed, baseball topped shifter. The Sport mode changes the gear ratios and computer mapping with the tachometer always in the sweep spot of the rev band for super-fast acceleration. Numerically lower 5th and 6th gear ratios also help enhance fuel economy. The high-revving V6 engine works in magnificent tandem with the twin-clutch sequential shifter. You instantly upshift as speed increases or downshift quickly to slow your speed when cornering. The foundation for the Ralliart Sportback’s agile handling is the rigid, performance-engineered global platform that also forms the basis for the Lancer Evolution chassis and also underpins the Mitsubishi Outlander crossover. 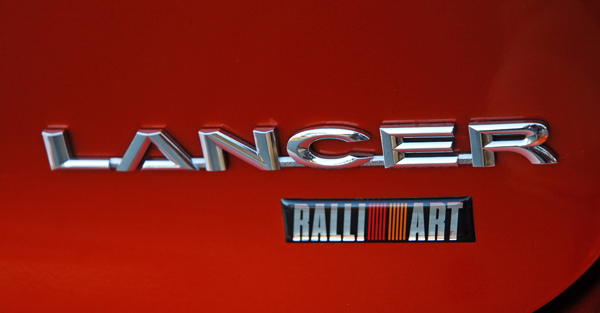 Putting the finishing touch on this high-performance and high-tech Lancer Ralliart is the All-Wheel Control (AWC) system that is based on a competition-derived, computer-controlled Active Center Differential (ACD) unit that distributes drive torque between the front and wheel wheels in response to driving conditions. You can set the system response parameters using a ‘Tarmac, Gravel, Snow selector. A helical limited-slip differential and a mechanical limited-slip differential rear differential help to optimize side-to-side torque distribution. 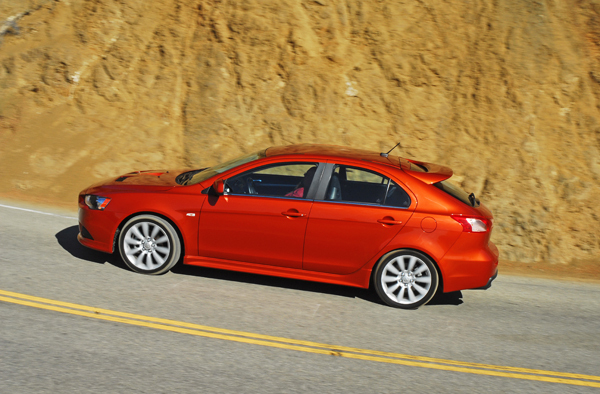 The AWC system gives the Lancer Ralliart Sportback its amazing acceleration and stability when attaching steep curving roads. 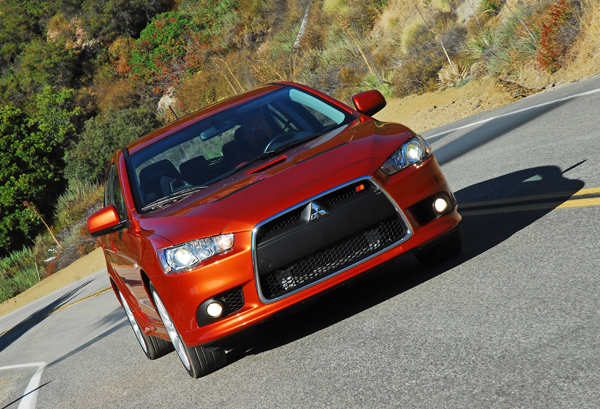 The Ralliart sport-tuned fully independent suspension and 18X8in. alloy wheels shod with 215/45R18in. Yokohama ADVAN summer tires complement the high traction afforded by the full-time active all-wheel drive setup. The front suspension features MacPherson struts, and a thick 22mm stabilizer bar. The rear multilink suspension features high-rate coil springs, gas-charged shocks and a 20mm stabilizer bar. This race-derived suspension system is a proven winner and is tight but never severe when driving over poorly paved roads. With the addition of a strut tower brace the hydraulic power-assisted rack & pinion steering system gives great feedback from the road with very quick reaction from your inputs. 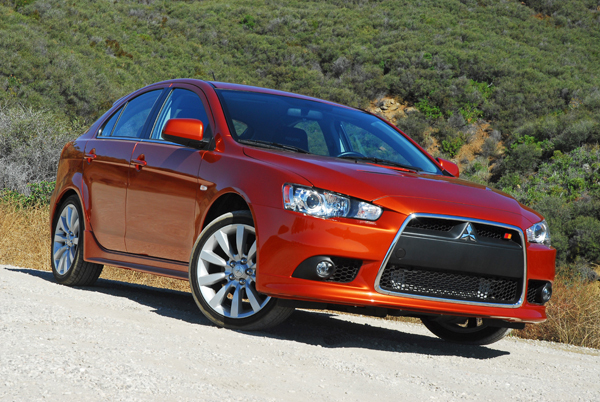 The on-center feel was perfect and well balanced giving you more than you would expect from the Ralliart Sportback. The standard Active Stability Control with Traction Control systems also contribute to safe handling maintaining your ability to stay on the pavement when cornering hard. Slowing the car down from speed are large, power-assisted, four-wheel steel disc brakes. Up front are 11.6in. vented disc clamped by dual-piston calipers while the rear features 11.9in. solid discs clamped by single-piston calipers. To increase braking force the brakes feature high-friction coefficient pads, and Electronic Brake Force Distribution. The ABS system keeps you in control of your direction when braking on slick or wet surfaces. The new Ralliart Sportback is fun and easy to drive with all eyes riveted on you and the car because this does look like a real rally race car with the high-mounted rear spoiler and other functional styling features. The car draws on styling cues from the Evolution MR with the aggressively formed front ‘jet fighter’ front bumper, rear bumper cover and dual, oval exhaust tips. From the front you’ll easily see the lower intercooler and the wide air-intake, an airdam to keep the front pushed down, round side foglamps, upper air-intakes for the engine and cat’s-eye HID headlamp clusters. A lightweight aluminum-ducted hood, borrowed from the Evolution sedan, delivers cooling air to the turbocharger via a scoop, and vents engine head with two extractors up front. From the side are steeply raked ‘A’ pillars, aero-styled side mirrors, pull-out door handles, a chrome molding strip at the beltline, scalloped doors that enhance aerodynamics, and deep side extensions that give the car a ‘road hugging’ look while lowering the center of gravity to further enhance cornering ability. From the rear you can’t miss the sleekly sloping rear door with the big integrated roof spoiler that increases downforce to push the rear solidly on the pavement at speed. The interior further accentuates the high-performance nature of the Ralliart Sportback with available RECARO sport bucket seats, a leather-wrapped/tilting, 3-spoke sport steering wheel both shared with the Evolution and the aluminum-faced throttle and brake pedals. 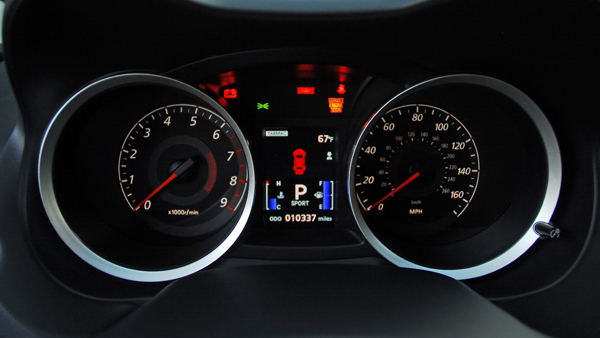 The easy-to-see electro-luminescent instrument cluster features a 170mph speedometer, 9,000rpm tachometer and deep, sky blue bar graphs for fuel onboard and engine coolant temperature. LED readouts warn of system or safety failures plus you can page through your current mpg, miles to empty, average speed, etc. All dials, switches and buttons are within easy reach and fully illuminated for safe nighttime travel. 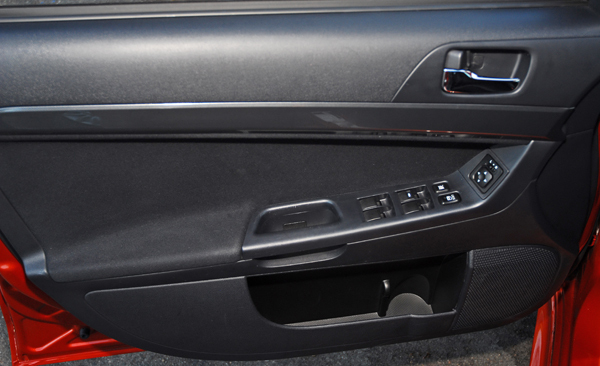 The dashboard features a wide strip of technical carbon fiber that goes to the end of each front door. The center console features dual cupholders under a flip open/close lid and the center storage bin/armrest slides fore/aft and can store your cell phone, CDs, etc. Two power plugs enable you to operate electronic gizmos. 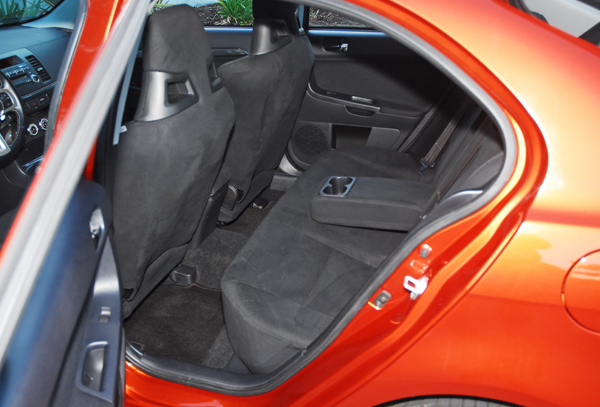 What clearly differentiates the Lancer Ralliart from the Ralliart sedan is the functional and versatile rear seats with pull-down center armrest and dual cupholders and 60/40 split rear seatbacks. 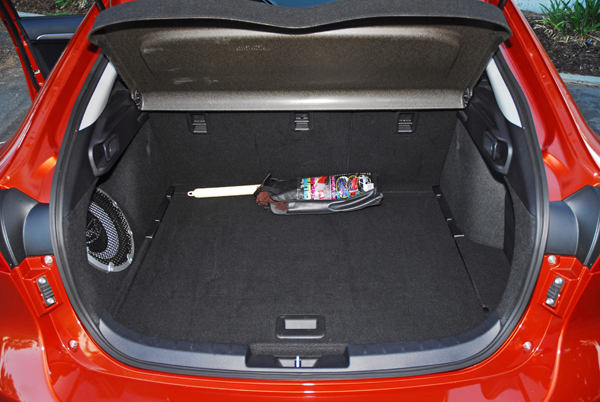 The rear cargo area features two latches on each rear side that you pull out to easily lower the second-row seatbacks to expand you cargo capacity and the rear liftgate makes loading and unloading all types and sizes of cargo easy. Standard user technology includes the FAST Key hands-free entry system, a Bluetooth HFP system wit voice recognition for hands-free calling and an auxiliary/MP3 input jack, a 40-GB HDD navigation system with music server and a 710-watt Rockfort-Fosgate Premium Audio system and SIRIUS satellite radio with 3-month pre-paid subscription is also available. Standard features not mentioned above include: automatic climate control with A/C and micron filtration, steering wheel mounted audio and cruise-control buttons, leather-wrapped sport steering wheel, parking brake and shifter, CD/MP3 audio head unit with 6-speakers, grab handles above each door, dual map lamps, dual visor mirrors, power-remote side mirrors, power windows/door locks, rear heater heat ducts, Ralliart logo floor mats, variable speed intermittent wipers/washers, rear wiper/washer, halogen headlamps, and MP3/auxiliary jacks behind a flip open/close door below the climate control dials. 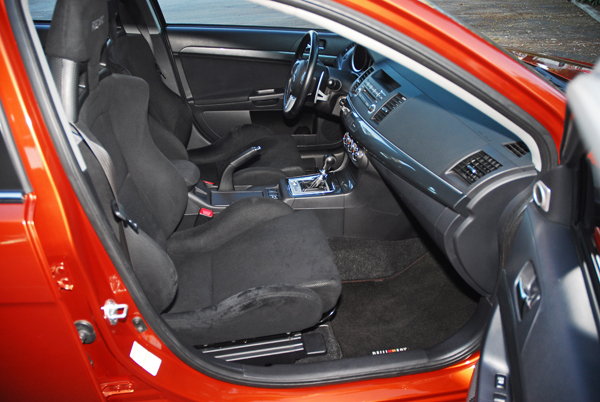 My Lancer Ralliart Sportback came equipped with the RECARO sport package that included their front seats, HID headlamps, 710-watt Rockford-Fosgate /Punch premium audio system with 9-speakers and a 10in. subwoofer and a CD/MP3 audio head unit. Standard safety equipment includes advanced dual front airbags, front seat mounted side impact airbags, side curtain airbags, driver’s side knee airbag, front/rear crumple zones, adjustable rear headrests, LATCH child seat anchors, tire pressure monitoring system, daytime running lamps, engine immobilizer, anti-theft alarm system, hill start assist, and 3-point safety belts for all five seating positions including front load limiters with pretensioners. 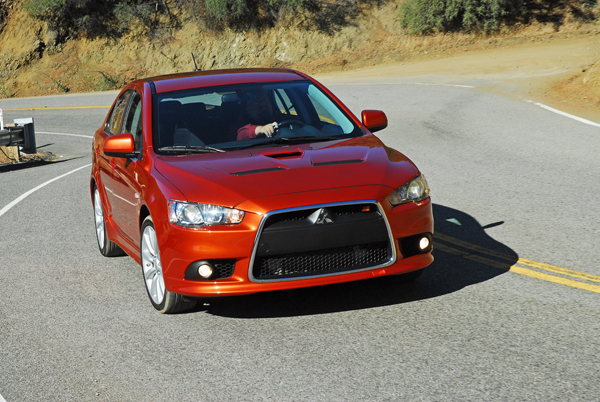 The all-new 2010 Mitsubishi Lancer Ralliart Sportback gives you the versatility that many active and sport enthusiast consumers are looking for. An exciting, rally race car look and ability plus the ability to reconfigure the rear cargo area to easily load and unload large and bulky items when necessary. Front Head Room: 39.6 in. Front Hip Room: 53.3 in. Front Shoulder Room: 54.7 in. Rear Head Room: 36.8 in. Rear Shoulder Room: 54.3 in. Rear Hip Room: 54.1 in. Front Leg Room: 42.3 in. Rear Leg Room: 35.9 in. Luggage Capacity: 13.8 cu. ft. Maximum Cargo Capacity: 47 cu. ft.
Fuel Tank Capacity: 14.5 gal. Automatic: 246.5 mi. / 362.5 mi. / 290 mi.